Kawaguchi Green Festival – Kawaguchi Green Center is well renowned as a great place to visit with kids. The Green Festival they are holding will be as equally kid friendly with lots of activities and entertainment planned for the whole family. On the first day of the Kawaguchi green festival, Saturday October 6th, there is a bingo activity for kids, “woodwork play” and a “green adventure competition”. There is also a tree climbing event between 10 am and noon and again between 1 pm and 4 pm. The Three Little Pigs will perform at 11.30 am and again at 1.30 pm. On the 2nd day, Sunday October 7th, they have crafts and the “green adventure competition” will be on again. The tree climbing event is on again too. You can try catching fish in a pool on this day too, always a popular festival activity with kids. A kids dance team will perform at 11 am and again at 1 pm. The 3rd day of the festival, Monday October 8th, will be of most interest to very young children as ANPANMAN and friends are coming to visit Kawaguchi Green Center! They will be performing on stage at 11.30 am and again at 2 pm. There are 4 other performances that day including a taiko drum performance. There is a parent and child activity scheduled that day too. The center’s popular road train will be available to ride (charged) each of the festival days too. There is a play equipment in the center too. From the official website, click to be redirected. 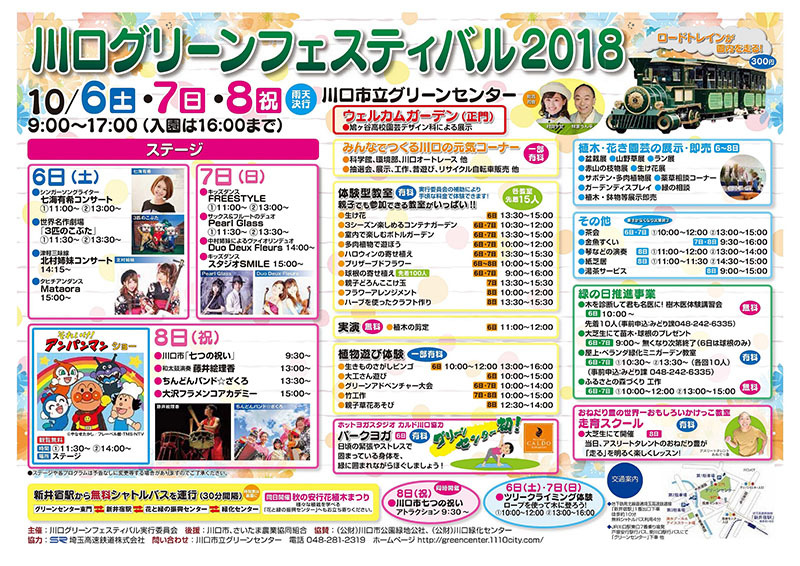 The festival is free, but it normally costs 310 yen to get into Kawaguchi Green Center for adults. The train ride is 300 yen per person. Map and address in the grey details box at the bottom of the post. By public transport: Kawaguchi Green Center is about a ten min walk from the Araijuku Station on the Saitama Rapid Railway Line. There is a free shuttle bus from this station (Araijuku) every 30 minutes for the duration of the festival. You can also access the center by taking a bus from bus stop no.7 from the east exit of Kawaguchi station. It is bound for Green Center グリーンセンター. By car: Free parking for 630 cars. Nearest highway exit is Kawaguchi Chuo on the Tokyo Gaikan motorway. For other events this weekend please see the Saitama event pages.